It’s no secret that adequate hydration is the main component of healthy, living cells and that this applies to all organisms on Earth, including our dearest friend – dog. Without water, your dog’s body will not be able to function properly. As water facilitates nutrient absorption and digestion, your dog must have the access to fresh water at all times. Well, even presuming there’s always someone in the household to actually do it, i.e., refill the water whenever necessary, there’s an even more challenging issue right around the corner – unwanted bacteria. You see, running water creates a hostile environment for the harmful bacteria by infusing it with oxygen. This leads to a much healthier drinking water. And that’s where the pet fountains come into play – by providing this desirable function. Apart from that, modern water fountains for dogs offer more benefits and advantages over water stream coming from your usual sink or garden hose, therefore, stick around to explore them with us in this article to find the best solution for your individual case. We encourage you to read more about the importance of water on petmd.com, as well as our article on appropriate HP-LC diet for dogs. As we’ve implied above, there are several benefits from using a modern-day dog water fountain which are crucial to your four-legged friend’s health. Check the list, consider your conditions, and match it with the one option from our list of top pet water fountains to provide the very best for your pup. Charcoal pads. As the water flows, charcoal pads or other filters purify it thus making the water not just more tasty but pure. This is the kind of water your dog is more likely to drink, which is especially important if you live in a hot, dry climate. Ceramic or stainless steel material. The reason behind this – plastic can easily become scratched. Afterward, these scratches can harbor the unwanted bacteria. Appropriate size and water capacity. You can find fountains that come in different sizes and shapes, and with different water reservoir capacities. If you’re a household with a large dog breed or one with multiple dogs (pets, as this actually applies to cats as well), it’s best if you seek a pet fountain with larger water capacity. If you have a larger dog or one with arthritic issues, consider fountains with elevated level. Easy to clean. More or less frequent than others, every water fountain for dogs require cleaning from time to time. Choose one with the materials and built that is easier to clean and requires less frequent maintenance. Please note (!) that the water pumps of these fountains are not meant to be washed in the dishwasher. When you see a label that claims this fountain is dishwasher safe, that only refers to the bowl and reservoir components (not the pump or any electronic parts). Some models have cleaning kits and instructions added. In addition to all this, fountains encourage your dog to drink more often as most canines are drawn to the sound mimics of the stream. For instance, does washing your car with a garden hose in a sunny summer day ring any bell? Quality water fountains will likely have an adjustable flow, too. These models have a knob to allow owners adjust the flow of water. This can be very useful for pets that prefer a certain level of water power and can also make it quieter (or louder based on the preference). Here are our reviews of 8 best dog water fountains that can be found on the market today. They’ve ranked on overall quality, however, one found lower on the list might be more suitable for your household specifically that one ranked higher, therefore, read thoroughly the analysis we’ve provided to choose the best one for your four-legged companion. There are several qualities that make this an all-around top-notch water fountain for your pet. First, let’s talk about the material. It’s made of environment-friendly high-quality ceramic that is non-toxic which is excellent for both dogs and cats that are sensitive (allergic) to plastic. Needless to say, the material is much sturdier and durable than it looks (it might look a bit fragile at first, at least to us, it did). Secondly, the dual-layered activated carbon filters have proven worthy when it comes to eliminating dirt and debris from your pet’s drinking water (2 replacement filters come along, too). On top of that, we really praise this product for keeping the water circulated making it much fresher than a static bowl. Another prominent quality we noticed about YouThink Dispenser is how quiet it is – you can barely hear the water flow sound when it’s total silence around. Speaking of the pump, it has 20’000 hour operating life (low power consumption). As the fountain has 2.1 liter capacity meaning it’s suitable for a multiple-pet household if you have small to medium sized dog breeds. If you own a Great Dale, we’d say this becomes a single-pet household’s source of clean water. We should also highlight, although not the most important aspect, this water dispenser allows your dog to drink it in 3 ways as shown in the picture below. The one drawback (for some) we have to point out, however, is that is water fountain is not for outdoors. Therefore, if you are looking for an appropriate water dispenser in your backyard or planning a family vacation or road trip with lots of outdoor activities, we can recommend other products. As for the cleaning, it’s fairly simple – you can use a dishwasher but not for the motor part (instead, go with warm water, dish soap, and a cloth). With that being said, overall, this truly makes the best dog fountain for indoors considering the main criteria and all the extras it has – highly recommended! HM tip: Consider this the overall best indoors water dispenser for your pet (or multiple pets) available on the market today. Based on many customers feedbacks, the overall satisfaction is also the highest as their four-legged companions truly enjoy the benefits of YouThink Dispenser. Okay, if we said our first pick’s 2.1 liter capacity is suitable for multiple-pet household, this could almost hydrate an entire farm! Jokes aside, this giant has a 18.9 liter (5 gallon) capacity (the manufacturer offers 3 options – this, which is 5 gallon, 6.5 gallon, and a smaller version of 3.5 gallon capacity), and is actually a good thing to consider for a dog daycare center. We like that’s it’s easy to move around this giant thanks to the locking wheels. It can be used both indoors and outdoors which is a huge advantage over some of the other counterparts in this list. Also, don’t let the size frighten you – it’s still easy to both fill and clean it (all the parts are dishwasher safe as you don’t have to deal with any electronics here). Assembling the entire construction should also be no challenge and can be a done in a few minutes. The main drawback might be the price which as approximately twice as big as for the pick No.1. And we agree – at least for a single-pet household, it might not be worth it. In fact, it’s not as elaborate as our previous pick, and although keeps the water clean and at an appropriate temperature (if you use the thermal cover), it doesn’t stand out as much. The bottom-line: can be considered for multiple-dog households and highly recommended for dog/pet daycare centers. HM tip: If you’re a dog daycare center owner, this machine can really be a great assistance for you. You can also consider this option if you’re a large household with several pets as you won’t have to worry your companions run out of clean water. This beautifully designed water fountain by PetSafe has several features that make it a very well built water dispenser for your pet – excellent water filters for fresh water, simple cleaning, and a magnificent look describes this highly praised product. The water capacity of around 2 liters is solid, yet, not extraordinary, and is more suited for small to medium-sized dog breeds if we’re considering multiple-pet household (similarly to our pick No. 1). The charcoal filters are replaceable, therefore, you shouldn’t worry about any bad odors. Another great feature is that the pump used for this product is very silent (note, however, that the water falling is audible – some people like it and find relaxing, some – exactly the opposite). The main drawbacks: the filters have to be replaced on regular basis, that is, for charcoal – every 3 to 4 weeks, and for the foam filter – every 5 to 8 weeks. Also, the bottom area is too narrow for large dog breeds to drink comfortably. Overall, it makes an excellent small dog breed (or cat) water fountain, not so much for Saint Bernards. HM tip: Consider this one of the best dog water fountains for small breeds (and cats). For instance, if you own a Bichon Frise and a kitty, this would be a great solution for fresh water. As only 1 of our previous top picks was suitable for outdoor use, we wanted to offer something in this regard. Even better, something you can take with you way farther than your backyard – on vacation! This travel-friendly water provider for pets requires no electricity or even batteries – the water is gravity fed. Unlike our previous pick, is suitable for large dogs, too, and even for sloppy drinkers as it maintains low water level deep in the bowl (the total capacity is 2 liters). In fact, some folks have even used it in a car, and it has a surprisingly good stability. The filters are solid though have to be replaced on monthly basis, especially, if used frequently. It’s hard to tell, however, how much water is left in the reservoir as there is no clear indicator. Also, the small slot where water comes out from could be easier to clean. 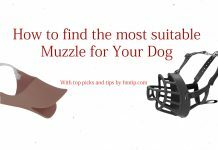 The bottom line: you will not come across a better option for your dog while traveling as Heyrex Torus provide the best characteristics and features for such conditions. HM tip: Hands down, consider this the best dog water dispenser for travel purposes. Another quality product by PetSafe, this dog water fountain is a good choice for indoors use (again, not suited for outdoors). We really like the spout rings that create up to five individual water streams that is kept clear by the replaceable foam filter. Excluding the pup, it’s dishwasher safe. PetSafe Drinkwell 360 Stainless Steel Pet Fountain has a larger water capacity than its PetSafe counterpart (3.8 liters), however, it loses to the same counterpart in terms of overall material quality as it does uses some plastic. Nevertheless, the base is stainless still which we appreciate (there’s a little cheaper version of the same made completely of plastic but we would not recommend it). This water fountain is suitable for multiple pets, and unlike the aforementioned counterpart, is more suited for medium to large-sized dog breeds. The filters, however, have to be changed more frequently – every 2 to 3 weeks. In the end, we want to point out the nice adjustability of water flow and simplicity when it comes to assembling and cleaning the fountain. 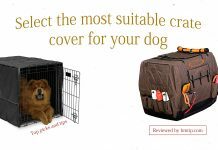 HM tip: If you like PetSafe products, consider this a great alternative for larger dogs and/or multiple pet households. Here’s another option for outdoors use (though certainly can be used inside a house as well) – Easy-Clean Auto-Fill Water Bowl. The floating valve detects low water levels while the dog is drinking and then replenishes the water accordingly. Desireable simplicity is the word that describes this product – you just connect it to your garden hose (outdoors) or washing machine house (indoors). It can be used for dogs (and other pets) of all sizes. The main drawback, however, is the main material used by the manufacturer – rather lightweight plastic that a big hound could easily knock around. At the end of the day, we agree with many customers that the idea and functionality are there, yet, the product requires significant improvement – at the moment, the overall quality doesn’t quite stand up for the price tag. Nevertheless, it still might be a better (cheaper) alternative for households with a garden and only 1 or 2 dogs than our pick No. 2. HM tip: Consider this water bowl a good choice for outdoors’ (also indoors) use if you own a dog or two – we really appreciate its auto-fill function that may come really useful when you’re not around at all times. Dog H2O water bowl is a very solid pick for an appealing price. It includes 3 Dental Care tablets that enhance water quality and is a great help against plaque and tartar build-up in your dog’s teeth. It’s dishwasher-friendly and we also like the fact that it’s quiet. Dog H2O is well suited for dogs of all sizes (might be a bit high for the smallest breeds). As for the filters, the ones used in this product last about a month or so, meaning, it’s kind of above-average compared to other water fountains that use similar filters. Although the material used might not be top-notch (ceramic or stainless steel), it’s still well-made water fountain with a great water capacity of almost 6 liters (200 fl. oz.). HM tip: Although the Dental tablets used in this product should not be considered a miracle remedy by any means, it’s actually a really nice extra to have as water is one of the main pillars of a healthy organism. Given its price, Dog H2O Water Fountain is more than a decent choice for your household if intended for indoors. 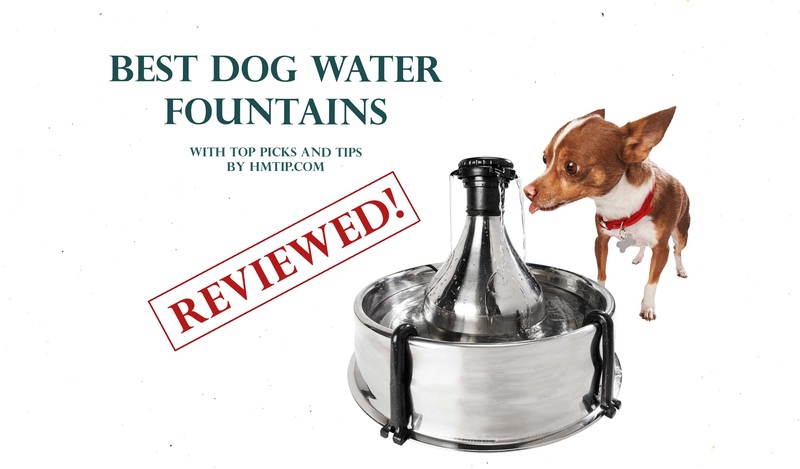 Now, we really wanted to add this last water fountain on the list as we like it so much, and the main reason why it ranks so low on this list is simply due the fact that we’re considering the best water fountain for dogs, not cats or other pets, and this product is just way too small to larger dog breeds. However, if you own a smaller breed (or other small pets), this might be an ideal choice for you for a very attractive price! Amzdeal Pet Fountain has many great features. Prominently, it has low power usage, is very quiet, quality charcoal filters (have to be replaced significantly rarer than others – approx. 2-3 months), and a nice blue LED night light so that you don’t stumble upon on your four-legged friends source of water (2-liter capacity). HM tip: Consider this one of the best options on the market if 1) you own a small dog, 2) intend to use it indoors. These were the 8 top water fountains or bowls worth your dog’s attention depending on its size, lifestyle, and other conditions. Thought we certainly love our pick No. 1 based on its many qualities, it might not be the best choice for everyone. For instance, it might be a bit too small for the largest dog breeds, or you might be better off with another option if you own more than just one pup. Therefore, please consider everything beforehand and then proceed with buying one of these so that whatever you choose may serve you and your dear companion faithfully. As always, leave your thoughts and questions by sending us an inquiry – we will always do our best to assist you whether it’s a product-related matter or anything that concerns your pet’s wellbeing. Previous articleMerrick dog food reviews – the best grain free dog food?